CNN’s POLITICAL GUT CHECK | for May 27, 2014 | 5 p.m.
OBAMA: COMBAT IN AFGHANISTAN TO END IN 2014 … President Barack Obama said Tuesday that he wants more than 9,800 U.S. troops to stay in Afghanistan after the end of 2014, with the number cut roughly in half by the end of 2015. By the end of 2016, he said, the military "will draw down to a normal embassy presence in Kabul, with a security assistance component." 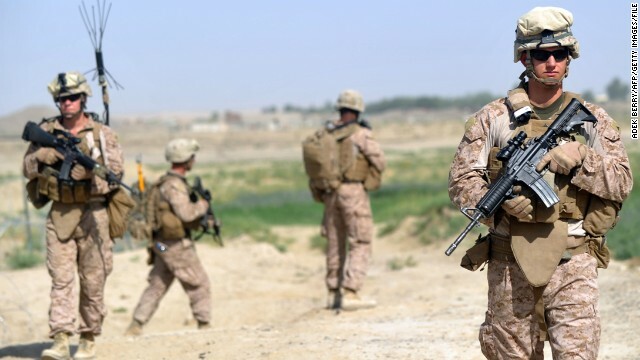 BUT SERVICE MEMBERS WILL STILL REMAIN … A senior administration official told CNN’s Jake Tapper that after 2016, the number of U.S. service members in Afghanistan providing embassy security and engaging in cooperative security efforts with the host government and military would likely number about 1,000. HOUSE ARMED SERVICES CHAIRMAN BUCK MCKEON: : “Holding this mission to an arbitrary egg-timer doesn’t make a lick of sense strategically ...We leave when the Afghans can manage that threat, rather than on convenient political deadlines that favor poll numbers over our security." CLINTON TOUTS 'INDISPENSABLE' AMERICA IN MEMOIR EXCERPTS … Hillary Clinton reflects on her long life in politics and her "unexpected" partnership with President Barack Obama in excerpts released Tuesday of her upcoming memoir. In Clinton's "Hard Choices" – which is due out on June 10 – the former secretary of State writes that when making decisions during her life she "listened to both my heart and my head." See more excerpts in HOT SOTS below. MARKET WATCH:S&P 500 ends at record high for second straight session. Dow gains 70 points while NASDAQ rises more than 1%. Which is the only U.S. state with a law outlining provisions for residents to vote from space? AYOTTE IN AN EMAIL TO SUPPORTERS: "Scott Brown has what it takes to win this election and represent New Hampshire values in Washington … He is the right guy for the job, and I would be proud to have him as my teammate in the United States Senate to keep fighting for New Hampshire families." Gut Check Full Service: If Brown wins he will be the first person to represent two states as a senator in over a century. Four words not in Afghanistan statement by the President: "Conditions on the Ground"
Earlier this year in TX primary, Rep Ralph Hall got 45% of vote vs John Ratcliffe with 29%. But no one got 50.1% to avoid runoff. VP Biden heading to Colorado later today to do a fundraiser for the re-election campaign of Sen. Mark Udall. No press coverage. @realDonaldTrump "I am no Bush fan..he got us into Iraq.."
A 1997 Texas state law signed by then-Gov. George W. Bush provides election guidelines for astronauts to electronically submit a ballot from space. According to the National Conference of State Legislatures, Texas is the only U.S. state that has passed such a law. Through Chapter 106 of its election code, voters in space can be sent ballots using NASA’s electronic transmission program. The first person to cast a celestial ballot was Houston astronaut David Wolf in 1997. According to the San Antonio Express-News, the provision has been used a handful of other times. Congrats to Adam Sharp (@AdamS) for correctly answering today’s Gut Check trivia question. ""We will bring America's longest war to a responsible end,""
And this goes for EVERYONE involved: there is no responsible "end" until you've successfully funded appropriate treatment for all the troops your warmongering injured (including mentally). That the wars themselves were not funded is abysmal. That the foreseeable, entirely predictable increase in need for medical services for our soldiers was not properly funded FROM THE GET-GO is a farking sin....a black mark on the soul of every person involved. "FLOTUS PICKS A FOOD FIGHT WITH CONGRESS … First lady Michelle Obama argued Tuesday that it's "unacceptable" for House Republicans to consider making major changes to the 2010 child nutrition law – a hallmark of her "Let's Move" campaign against childhood obesity "
In other words, she created a great program, the GOP/Teatrolls picked a fight with her by attacking it, she expresses disappointment in their attacks on it and then CNN characterizes it as her "picking a fight" with them. Got it. Up is down, left is right, light is dark, etc. Oh goodie, ms Lindsay, the man who have us the screecher from ask and the little woman want us to keep our men and women in harms way and die. Maybe brown should have waited to tell the world this woman supports him. Anything to stop the dems hand0uts to PPL more than willing to put out work if they could find work . Well , auott will be GONE in the next election, all she does is PARROT the GOP line and has done NOTHING for New Hampshire !!!! If the incompetent,inept president and his corrupt administration are always going to claim they find out about all of thse scandals through the media, then they should at least watch Fox New, so they know what is true rather than those synchophants in the mainstream media. Unbelievable.... If you are a Democrat, you simply cannot distance yourself enough from the failed President. I can hardly wait until the Democrats and liberals in here rip her to shreds for these comments.